The 1988 Winter Olympics, officially known as the XV Olympic Winter Games (French: Les XVes Jeux olympiques d'hiver), was a Winter Olympics multi-sport event celebrated in and around Calgary, Alberta, Canada, between February 13 and 28, 1988 and were the first Winter Olympics to be held over a whole two week period. The host city was selected in 1981 over Falun, Sweden, and Cortina d'Ampezzo, Italy. Most events took place in Calgary while several skiing events were held in the mountain resorts of Nakiska and Canmore, west of the city. A then-record 57 nations competed and 1,423 athletes participated. As it had in Montreal in 1976, Canada again failed to win a gold medal in an official medal event as the host nation. Finnish ski jumper Matti Nykänen and Dutch speed skater Yvonne van Gennip were individual medal leaders with each winning three gold medals. The games are also remembered for the "heroic failure" of British ski jumper Eddie "The Eagle" Edwards, and the Winter Olympic début of the Jamaica national bobsled team, both of which would be subjects of major feature films about their participation in the games. The Calgary games were at the time one of the most expensive Olympics ever held, but the organizing committee turned record television and sponsorship revenue into a net surplus that was used to maintain the facilities built for the Olympics and develop the Calgary region into the heart of Canada's elite winter sports program. The five purpose-built venues continue to be used in their original functions, and have helped the country develop into one of the top nations in Winter Olympic competition; Canada more than quintupled the five medals it won in Calgary at the 2010 games, the next Winter Olympics hosted on Canadian soil in Vancouver. Calgary is the largest city to host the Winter Olympics; however, the census metropolitan area of Greater Vancouver could also be considered the largest metropolitan area to host the Winter Olympics. Nonetheless, this title will soon to be turned over to Beijing in 2022. The bid for the 1988 Winter Olympics was Canada's seventh attempt at hosting a winter games and Calgary's fourth. Previous bids representing Montreal (1956) and Vancouver (1976 and 1980) bookended failed attempts by the Calgary Olympic Development Association (CODA) to host the 1964, 1968 and 1972 games. The CODA became dormant in 1966 after losing its bid for the 1972 Olympics, but was revived in 1979 under the leadership of Frank King to bid for the 1988 games. Calgary earned the right to bid on behalf of Canada by the Canadian Olympic Association (COA), defeating a rival challenge from a group representing Vancouver. The defeated organizing group lamented that they lost to Calgary's "big-ticket games"; the Calgary bid proposed to spend nearly three times what the Vancouver group expected to pay to host the Olympics. The CODA then spent two years building local support for the project, selling memberships to 80,000 of the city's 600,000 residents. It secured C$270 million in funding from the federal and provincial governments while civic leaders, including Mayor Ralph Klein, crisscrossed the world attempting to woo International Olympic Committee (IOC) delegates. Driven by the arrival of the National Hockey League's Calgary Flames, the city had already begun constructing an Olympic coliseum (later named the Olympic Saddledome) prior to the IOC vote, an action that demonstrated Calgary's determination to host the games and positively influenced delegates. The city was one of three finalists, opposed by the Swedish community of Falun and Cortina d'Ampezzo, the Italian town that hosted the 1956 Winter Olympics. The vote was held September 30, 1981, at Baden-Baden, West Germany, during the 84th IOC Session and 11th Olympic Congress. After Cortina d'Ampezzo was eliminated in the first round of balloting, Calgary won the right to host the games over Falun by a 48–31 vote. The announcement of the CODA's victory sent delegates in Baden-Baden and residents of Calgary into celebration. It was the first Winter Olympics awarded to Canada, and the second games overall, following the 1976 Summer Olympics in Montreal. The IIHF called the Olympic Saddledome "the finest international rink in the world". It is also the largest hockey arena ever used at the Olympics with a capacity of 20,016 in 1988. It was Bill Pratt, the former contractor who took over as Calgary Organizing Committee president in 1983, and who supervised the enormous construction project. Says Donald Jacques, general manager of the Calgary Exhibition and Stampede: "Because of him, everything was built on time and on budget." But Pratt rubbed many colleagues the wrong way. As a former co-worker predicted in 1983: "He will get everything built. There may not be many left around to enjoy it, but he'll get it done." His relations with the media were also difficult at times. He had barely settled into his job when the Calgary press began criticizing the committee for excessive secrecy and for awarding Olympic contracts to the Calgary public relations firm of Francis Williams and Johnson, where Pratt had been a director, oco insisted there was no conflict of interest. Declares Pratt: "I have been nailed for a lot, but that does not bother me. The record stands." McMahon Stadium, Calgary's primary outdoor facility, was the site of both the opening and closing ceremonies, the first time in 28 years that the same venue hosted both events. Three other existing venues served as secondary facilities: The Max Bell Centre hosted the demonstration events of curling and short track speed skating. The Father David Bauer Olympic Arena hosted some ice hockey matches, as did the Stampede Corral, which also played host to some figure skating events. Though the Corral did not support the size of the International Ice Hockey Federation (IIHF)'s standard ice surface, the Calgary Organizing Committee (Olympiques Calgary Olympics '88 or OCO'88) was able to convince the IIHF to sanction the arena in exchange for a $1.2 million payment. The Games' five primary venues were all purpose-built however, at significant cost. The Olympic Saddledome was the primary venue for ice hockey and figure skating. Located at Stampede Park, the facility was expected to cost $83 million but cost overruns pushed the facility to nearly $100 million. The Olympic Oval was built on the campus of the University of Calgary. It was the first fully enclosed 400-metre speed skating venue in the world as it was necessary to protect against the possibility of either bitter cold temperatures or ice-melting chinook winds. Seven world and three Olympic records were broken during the Games, resulting in the facility earning praise as "the fastest ice on Earth". Canada Olympic Park was built on the western outskirts of Calgary and hosted bobsled, luge, ski jumping and freestyle skiing. It was the most expensive facility built for the games, costing $200 million. Two facilities were built west of Calgary, in the foothills of the Rocky Mountains. The Canmore Nordic Centre was 90-percent funded by the Province of Alberta at a cost of $17.3 million. Located near the community of Canmore it was built with the intention that it would become a year-round recreation destination for Albertans. The facility hosted cross-country skiing, biathlon and Nordic combined events. Nakiska (Cree for "to meet") was the most controversial facility built. The province paid the $25 million construction cost for the alpine skiing facility on Mount Allen, about an hour west of Calgary. It was initially criticized for the location's relative lack of snow, requiring artificial snow making machines to be installed, and for an initial lack of technical difficulty. International Ski Federation officials proposed modifications to the courses that ultimately met with praise from competitors. The Calgary Winter Olympics were the first winter games to earn a significant television revenue base; where the 1980 Lake Placid Games generated only US$20.7 million worldwide, OCO'88 generated $324.9 million in broadcast rights. The overwhelming majority of television revenues came from the American Broadcasting Company (ABC), which agreed in 1984 to pay $309 million for American television rights, over three times the $91.5 million it paid for the 1984 Winter Olympics in Sarajevo. The deal, at the time the highest amount ever paid for a sporting event, allowed organizers to announce the Games would be debt-free. The CTV Television Network paid C$4.5 million for Canadian rights and to act as the host broadcaster. The games were also televised on CBC. While western European nations paid US$5.7 million combined. OCO'88 made several alterations to the Olympic program as part of efforts to ensure value for its broadcast partners. Premier events, including ice hockey and figure skating, were scheduled for prime time and the Games were lengthened to 16 days from the previous 12 to ensure three weekends of coverage. However, a significant downturn in advertising revenue for sporting events resulted in ABC forecasting significant financial losses on the Games. Calgary organizers appreciated their fortunate timing in signing the deal. King described the timing of the contract with ABC as "the passing of the sun and the moon at the right time for Calgary." ABC lost an estimated $60 million, and broadcast rights to the 1992 Winter Olympics were later sold to the CBS network for $243 million, a 20% reduction compared to Calgary. A series of ticket-related scandals plagued the organizing committee as the Games approached, resulting in widespread public anger. Demand for tickets was high, particularly for the premier events which had sold out a year in advance. Residents had been promised that only 10 percent of tickets would go to "Olympic insiders", IOC officials and sponsors, but OCO'88 was later forced to admit that up to 50 percent of seats to top events had gone to insiders. The organizing committee, which was subsequently chastised by mayor Klein for running a "closed shop", admitted that it had failed to properly communicate the obligations it had to supply IOC officials and sponsors with priority tickets. These events were preceded by OCO'88's ticketing manager being charged with theft and fraud after he sent modified ticket request forms to Americans that asked them to pay in United States funds rather than Canadian and to return them to his company's post office box rather than that of the organizing committee. Organizers attempted to respond to public concern by asking sponsors to consider reducing their orders and by paying $1.5 million to add 2,600 seats to the Saddledome. King also noted that the Calgary Games offered a then-record 1.7 million tickets for sale, three times the amount available at Sarajevo or Lake Placid, and that 82 percent of them were going to Calgarians. By their start, a Winter Games' record of over 1.4 million tickets had been sold, a figure that eclipsed the previous three Winter Games combined. 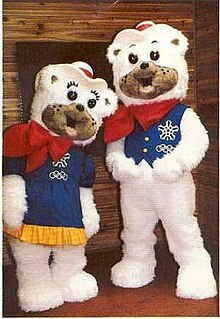 Hidy and Howdy were the mascots of the Calgary Games. The city, which already had a strong volunteering tradition with the annual Calgary Stampede, also relied heavily on volunteers to run the Olympics. Over 22,000 people signed up to fill 9,400 positions, no matter how inglorious: doctors, lawyers and executives offered to clean manure dropped by horses at the opening ceremonies. Many residents participated in a "Homestay" program, opening their homes to visitors from around the world and renting rooms to those who could not stay in a hotel. Klein was among those who felt it necessary that the event be community driven, a decision which allowed the city's welcoming spirit to manifest. The Games' mascots, Hidy and Howdy, were designed to evoke images of "western hospitality". The smiling, cowboy-themed polar bears were popular across Canada. Played by a team of students from Bishop Carroll High School, the sister-brother pair made up to 300 appearances per month in the lead up to the Games. From their introduction at the closing ceremonies of the Sarajevo Games in 1984 until their retirement at the conclusion of the Calgary Games, the pair made about 50,000 appearances. The iconic mascots graced signs welcoming travelers to Calgary for nearly two decades until they were replaced in 2007. Held at a price of C$829 million, the Calgary Olympics cost more to stage than any previous Games, summer or winter. The high cost was anticipated, as organizers were aware at the outset of their bid that most facilities would have to be constructed. The venues, constructed primarily with public money, were designed to have lasting use beyond the Games and were planned to become the home of several of Canada's national winter sports teams. The Games were a major economic boon for the city which had fallen into its worst recession in 40 years following the collapse of both oil and grain prices in the mid-1980s. A report prepared for the city in January 1985 estimated the games would create 11,100 man-years of employment and generate C$450-million in salaries and wages. In its post-Games report, OCO'88 estimated the Olympics created C$1.4 billion in economic benefits across Canada during the 1980s, 70 percent within Alberta, as a result of capital spending, increased tourism and new sporting opportunities created by the facilities. The 1988 Winter Games began on February 13 with a $10 million opening ceremony that featured 5,500 performers, an aerial flyover by the Royal Canadian Air Force's Snowbirds, the parade of nations and the release of 1,000 homing pigeons. Canadian composer David Foster performed the instrumental theme song ("Winter Games") and its vocal counterpart ("Can't You Feel It? "), while internationally recognized Canadian folk/country musicians Gordon Lightfoot and Ian Tyson were among the featured performers. Governor General Jeanne Sauvé opened the Games on behalf of Queen Elizabeth II as an estimated 1.5 billion people watched the ceremony. The weather was a dominant story throughout much of the Games, as strong chinook winds that brought daily temperatures as high as 17 °C (63 °F) wreaked havoc on the schedules for outdoor events. Events were delayed when winds were deemed unsafe for competitors and organizers used artificial snow making equipment to ensure skiing venues were properly prepared. It was the first time in Olympic history that alpine events were held on artificial snow. The Games were also marred by the death of the Austrian ski team's doctor, Joerg Oberhammer, on February 25 after a collision with another skier sent him crashing into a snow grooming machine at Nakiska, crushing and killing him instantly. The incident was ruled an accident. The top individual competitors at the Olympics were Finnish ski jumper Matti Nykänen and Dutch speed skater Yvonne van Gennip as they each won three gold medals. Italy's Alberto Tomba won gold in two skiing events, his first of five career Olympic medals en route to becoming the first alpine skier to win medals at three Winter Games. East Germany's Katarina Witt defended her 1984 gold medal in women's figure skating, capturing a second gold in Calgary. Her compatriot Christa Rothenburger won the gold medal in the 1000 metre race in speed skating, then went on to win a silver medal in the team sprint cycling event at the 1988 Summer Games to become the only person in Olympic history to win medals at both Olympic Games in the same year. The Soviet Union won gold in hockey as Scandinavian neighbours Finland and Sweden took silver and bronze, respectively. As it had in 1976, Canada again failed to win an official gold medal as the host of an Olympic Games. Canadians won two gold medals in demonstration events, including by Sylvie Daigle as one of her five medals in short-track speed skating. Canada's top official performances came in figure skating where Brian Orser and Elizabeth Manley each won silver medals. Promoted by the media as the "Battle of the Brians", the competition between Orser and American rival Brian Boitano was the marquee event of the Games. Boitano won the gold medal over Orser by only one-tenth of a point. Manley was not viewed as a medal contender, but skated the greatest performance of her career to come within a fraction of Witt's gold medal winning score. American speed skater Dan Jansen's personal tragedy was one of the more poignant events of the Games as he skated the 500 metre race mere hours after his sister Jane died of leukemia. A gold medal favourite, Jansen chose to compete as he felt it is what his sister would have wanted. Viewers around the world witnessed his heartbreak as he fell and crashed into the outer wall in the first quarter of his heat. In the 1000 metre race four days later, Jansen was on a world record pace when he again fell. After failing again in Albertville, Jansen finally won a gold medal at the 1994 Lillehamer Games. One of the most popular athletes from the games was British ski jumper Eddie "The Eagle" Edwards, who gained infamy by placing last in both the 70 and 90 metre events finishing 70 and 53 points behind his next closest competitor, respectively. Edwards' "heroic failure" made him an instant celebrity; he went from earning £6,000 per year as a plasterer before the Games to making £10,000 per hour per appearance afterward. Left embarrassed by the spectacle he created, the International Ski Federation altered the rules following Calgary to eliminate each nation's right to send at least one athlete and set minimum competition standards for future events. Regardless, the President of the Organizing Committee, Frank King, playfully saluted Edwards' unorthodox sporting legacy, which would also be commemorated with a 2016 feature film, Eddie the Eagle. The Jamaican bobsleigh team, making their nation's Winter Olympic debut, was also popular in Calgary. The team was the brainchild of a pair of Americans who recruited individuals with strong sprinting ability from the Jamaican military to form the team. Dudley Stokes and Michael White finished the two-man event in 30th place out of 41 competitors and launched the Jamaican team into worldwide fame. The pair, along with Devon Harris and Chris Stokes, crashed in the four-man event, but were met with cheers from the crowd as they pushed their sled across the finish line. Their odyssey was made into the 1993 movie Cool Runnings, a largely fictionalized comedy by Walt Disney Pictures. A record 57 National Olympic Committees (NOCs) entered athletes at the 1988 Calgary Olympics, 8 more than appeared at any previous Olympic Winter Games. 1,423 athletes participated in 46 events: 1,122 men and 301 women. Fiji, Guam, Guatemala, Jamaica, the Netherlands Antilles and the Virgin Islands had their Winter Olympics debut. A set of medals from the Games on display at the Scotiabank Saddledome in Calgary. Prior to Calgary, the Winter Olympics were viewed as a second-rate event compared to their summer counterpart, so much so that the IOC had at one point considered eliminating them entirely. Few cities bid on the Winter Games due to challenges faced in generating revenue. In its bid for the Games, CODA convinced the IOC that it could not only generate enough revenue to turn a profit, but enough of one to ensure a lasting legacy of winter sport development. Organizers followed the lead of their counterparts in Los Angeles for the 1984 Summer Olympics, attracting a large television contract in the United States and was the first host city to benefit from a change in the IOC's strategy on corporate sponsorship. The Calgary Games attracted support from over two dozen major Canadian and multinational corporations, generating millions of dollars in revenues. Many program changes were made in Calgary to grow the appeal of the Winter Games for sponsors: the extension to 16 days from 12 added an extra weekend of coverage, while the additional programming time was filled by television friendly demonstration events popular in Canada. The exposure curling, freestyle skiing and short-track speed skating gained in Calgary influenced the growth in their popularity and led to all three becoming full medal sports by 1998. Hosting the Games helped fuel a significant increase in Calgary's reputation on the world stage. Crosbie Cotton, a reporter for the Calgary Herald who covered the city's Olympic odyssey from its bid to the closing ceremonies, noted a change in the attitude of the city's population over time. He believed that the populace began to outgrow its "giant inferiority complex" that is "typically Canadian", replacing it with a new level of confidence as the Games approached. They helped the city grow from a regional oil and gas centre best known for the Calgary Stampede to a destination for international political, economic and sporting events. A study prepared for the organizing committee of the 2010 Vancouver Olympics claimed that Calgary hosted over 200 national and international sporting competitions between 1987 and 2007 due to the facilities it had constructed for the Olympics. The Games' enduring popularity within Calgary has been attributed to efforts to make them "everybody's Games". Aside from the sense of community fostered by the level of volunteer support, organizers included the public in other ways. People were given opportunity to purchase a brick with their names engraved on it and used to build Olympic Plaza, where medal ceremonies were held in 1988. It remains a popular public park and event site in the city's downtown. Members of the community have attempted to bring a second Winter Games to the city. Calgary offered to take over the 2002 Winter Olympics after a bribery scandal resulted in speculation that Salt Lake City would be unable to remain the host. The city also made an effort to bid for the 2010 Games on Canada's behalf, losing to Vancouver. A 2013 Calgary Sun online poll found that 81% of respondents would support the city hosting a second Olympics. Canada increased its medal totals in each successive Winter Games from Calgary until Vancouver in 2010. Mindful of the financial disaster the Montreal Olympics became, OCO'88 parlayed its ability to generate television and sponsorship revenues and government support into what was ultimately a C$170 million surplus. (The claim of a surplus has frequently been challenged as OCO'88 counted only its own revenues and expenses and did not include government funded facilities in its accounting.) The surplus was turned into endowment funds split between Canada Olympic Park ($110 million) and CODA, which was reformed following the Games to manage the Olympic facilities with a trust fund that had subsequently grown to be worth over $200 million by 2013. Consequently, all five of the primary facilities built for the 1988 Olympics remained operational in their original intended purpose 25 years after the Games concluded. Calgary and Canmore became the heart of winter sport in Canada as CODA (now known as Winsport Canada) established itself as the nation's leader in developing elite athletes; in 2006, one-quarter of Canada's Olympic athletes were from the Calgary region and three-quarters of its medalists were from or trained in Alberta. Canada was not a winter sport power in 1988; the nation's five medals in Calgary was its second best total at a Winter Olympics behind the seven it won at the 1932 Lake Placid Games. After 1988, Canada won an increasing number of medals at each successive Olympics, culminating in a 26-medal performance in 2010 that included a Winter Olympic record of 14 gold medals, one more than the previous record holders Soviet Union (1976) and Norway (2002). In 2018 in Pyeongchang, South Korea, Team Canada earned its highest count of medals in the Winter Olympics with a total of 29 medals. ^ The emblem is a stylized, pentagon-shaped, snowflake and maple leaf, made up of five large and five small letters of "C" to symbolize the country of Canada and the city of Calgary, above the Olympic rings. ^ Walmsley, Ann (February 2, 1988). "The Men who Made it Work: The road to the Olympics turned into a collision course for several strong personalities". Maclean. Retrieved November 27, 2018. Wikimedia Commons has media related to 1988 Winter Olympics. "Calgary 1988". Olympic.org. International Olympic Committee. "Results and Medalists — 1988 Winter Olympics". Olympic.org. International Olympic Committee.